Microsoft has released a new version of Windows Live for Windows phones running Windows Mobile Professional and Standard operating systems. Windows Live Messenger, Hotmail, Photos and the “What’s New” feed are now all available on your 6.x Windows phone. 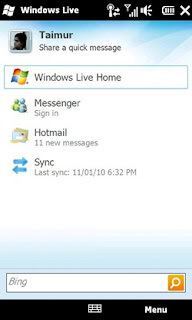 Windows Live™ for Windows® phone (Std) is for use with a non-touch phone and Windows Live™ for Windows® phone (Pro) is for use with a touch phone. Alternatively you can browse to http://wl.windowsmobile.com/ using Internet Explorer on your device to install using direct download.